This article is about a creature, item, or feature that is not yet released on Mobile. The Megalania (me-ga-lai-nia) is one of the Creatures in ARK: Survival Evolved. Megalania muruspede is among the largest creatures found throughout the Island's complicated cave networks. Reaching up to three meters long, it can traverse vertically up cave walls with little difficulty thanks to its powerful claws. Fortunately, Megalania's size means it is unlikely to sneak up on anyone. Unfortunately for spelunkers, it is an aggressive and dangerous creature nonetheless. Like other Varanidae, Megalania is a venomous creature. Its poison is slow-acting, but will drain the victim's effective strength and health until death unless cured by a rare antidote. That said, the Megalania's prey are usually ripped apart well before they succumb to the poison's long-term effects. The rare ability of Megalania to effortlessly climb sheer environmental walls makes it a highly sought-after mount. While it is by no means the fastest, strongest, or toughest mount, the manner in which it can effortlessly scale mountains, clamber up barricades, hide in trees or upside-down, ensures it will always have place in any tribe's stables! The Megalania is found in many places including the highland sands on ragnarok also caves and the Trench in the Extinction DLC, where it waits on the ceilings and walls silently, ready to pounce on prey below. As is the case with other cavern dwellers, Megalania are neutrally disposed toward other native creatures, like Onyc, Dung Beetle, Mantis, and Megalosaurus. They tend to hide in shadowy recesses of ceilings and walls, making them extremely difficult to spot without assistance of items like a Tek Helmet or a Shadow Steak Saute. Consuming Rare Flowers will cause them to drop from the ceiling and become aggressive. Similar to the Megalosaurus, Megalania are usually only found in limited numbers in a given cave, so while it may be common to find them in the Upper South Cave, for instance, not many live there at any given time. The Megalania is a huge lizard resembling a Komodo Dragon. It has a stocky, low-lying build with a powerful tail and a toothy maw, drooling with venom. Despite its size, it is capable of climbing walls like a gecko to sneak up on prey and traverse difficult terrain - a useful adaptation for a massive cave-dweller like it. This section displays the Megalania's natural colors and regions. For demonstration, the regions below are colored red over an albino Megalania. 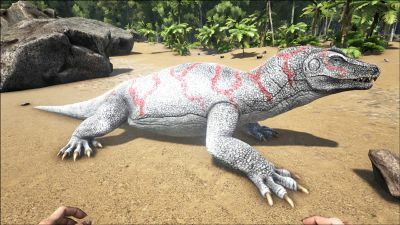 The colored squares shown underneath each region's description are the colors that the Megalania will randomly spawn with to provide an overall range of its natural color scheme. Hover your cursor over a color to display its name and ID. Server admins can use this region information in the Console Command "cheat SetTargetDinoColor <ColorRegion> <ColorID>". 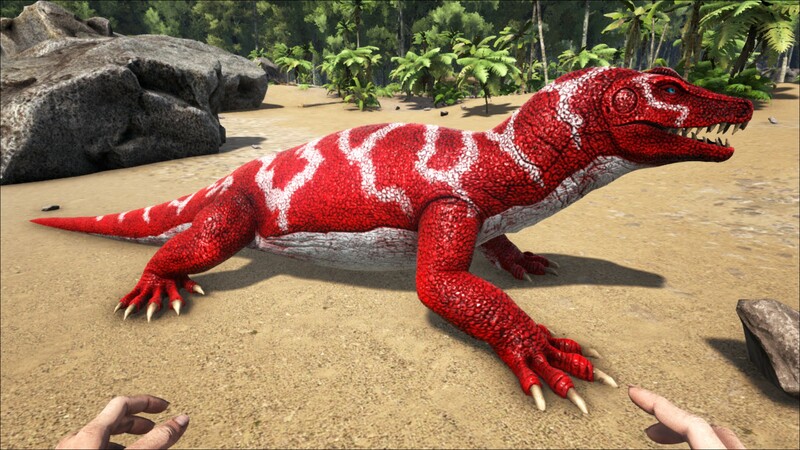 For example, "cheat SetTargetDinoColor 0 6" would color the Megalania's "main body" magenta. For general infos about domesticating a wild creature see Taming. Found on the ceilings of caves, one must look up in order to find this elusive lizard. The easiest method found so far is to fire from the back of a mount and let it take the beating. While downing the Megalania is relatively easy, keeping it down is a feat. The torpor loss is extremely quick and if one is not careful they'll find their potential tame awake and angry within seconds. It eats kibble every 120 food lost. Note that the values are for optimal cases, always bring extra supplies! For a level-dependent count of resources needed, try an external taming calculator. This section describes how to fight against the Megalania. If you can't see them in a cave, they are likely there but not visible. Terrain on walls and ceilings can completely obscure them. You can force them to come out by making them become aggressive by gaining the rage effect, either by having your survivor eat a rare flower or by using a Pachyrhinosaurus's alternate (default C) rage-evoking attack. By so doing, you can prevent them from springing upon you when you don't expect it. You can force them down from a better distance and more likely engage the battle on your own terms. Avoid close range weapons such as the Pike. Getting too close can make the Megalania give you rabies. Use weapons like the Crossbow or Shotgun. The rabies effect can cause health and stamina to drop very quickly. Like the Thylacoleo, shooting it knocks it down from the ceiling. It spawns on the ceilings of caves like a Thylacoleo spawns on a Redwood forest tree and, like the Thylacoleo, it can't climb back up onto the ceiling. Only tamed Megalania can climb on any surface. Use bear traps as well to slow it down. Climbing walls and ceilings: Megalania has excellent mobility, as it is the one of the only creatures in Ark along with the Rock Drake, and the only creature outside of Aberration that can climb on walls and ceilings, while Thylacoleo can only climb walls. 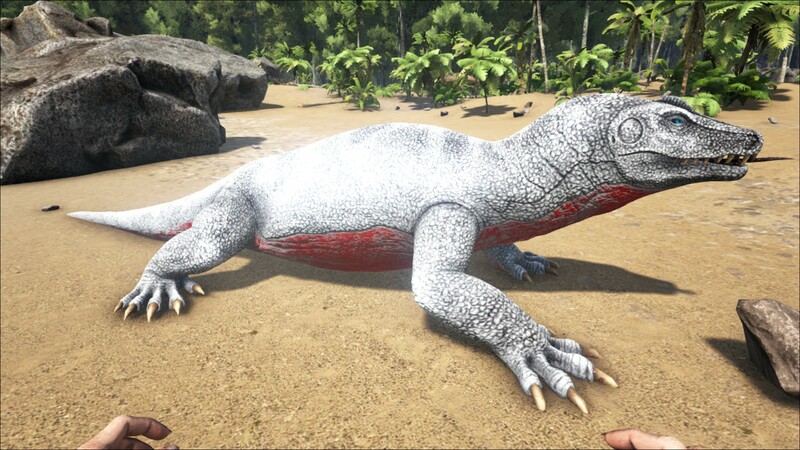 Mass Infector: The attack of a Megalania can infect a survivor with Rabies, a condition that constantly damages both health and stamina over time. In addition, someone with Rabies can spread it to others around them. An afflicted survivor cannot infect another who is riding the Megalania that spread that strain of Rabies. Cave Crawler: Its ability to traverse many surfaces makes it an almost ideal option for cave exploration, although its sub-par melee damage and slow attack may lead to struggled fights, and its turning radius will be troublesome when dealing with Onyc. Dino Dossier was revealed on 12/07/15 on Steam. The original release of the dossier had diet and temperament switched, resulting in an aggressive diet and a carnivorous temperament. This has since been fixed. Megalania is actually no longer a valid genus. The real-life animal is currently known as Varanus priscus after it was concluded Megalania is related to modern day monitor lizards, which belong to the genus Varanus. Despite this, the name "Megalania" is still used to describe the animal as a common name. using the jump-key (space, , ) you can switch between climbing and walking. If you are currently climbing, switching will make you fall off the wall or ceiling. It appears the Megalania is unable to access the boss arenas much like flyers to avoid the climbing breaking the fights. Cheat-summoned Megalania will be teleported to nearby cliffs and stop moving. If there is no nearby cliff, it will wander and try to attack preys. Wild Megalania can't harm wild creatures. This seems to be an error, because it approaches to potential prey and shows the attack animation. Megalania was the only climbing mount, until the introduction of Aberration, in which Rock Drake is introduced, another mount that can climb ceiling with additional benefits. However, because of the size and the location where you find it, this makes it the only large-sized climbing mount, while Megalania remains the only medium-sized climbing mount. Although an Aberrant Megalania variant exists in the game files and Devkit, they don't spawn on Aberration due to a design choice. This page was last edited on 14 April 2019, at 16:35.